Finally we started our first trip! After a couple of days spent on the streets of Mazatlan, we decided that it’s time for our first adventure! 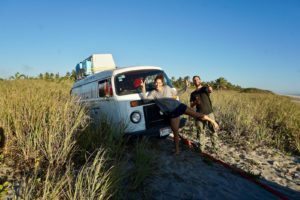 Living and traveling in a van! Our destination: Stone Island! Far away from the city, under palm trees and just in front of the ocean. 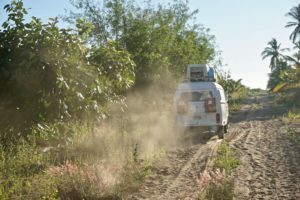 Soon our biggest concern should be the Rusty Old Van’s ability to drive on deep white sand. Second thoughts came up… For the fancy super Truck from K P and Taylor the sand wasn’t a big issue. For the Rusty Old Van, however, it was a big one!! After a hundred meters it got stuck for the first time…no worries!! Taylor, as an experienced Rallye driver knew what to do. And with less air in the tires we drove a little further. But just a little bit. And this time we got stuck deeeeeeeeep!!! 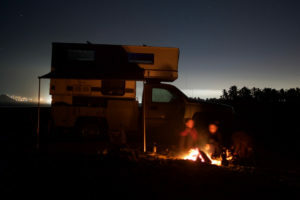 Instead of turning around or giving up, we decided towing should get us to our dream spot. So we did. K P towed us to our desired spot. Our sliding door facing to the ocean. In all honesty this trip was amazing. For the first time since a very long time there was nothing than the burning fire and the sound of crashing waves. And so we sat under the stars in the sky and realised our lives are that beautiful.